Plant health can be greatly affected by pH (acidic or basic), salinity (soluble salts), and alkalinity, yet these factors are often ignored by growers. It is easy to test for these three important parameters using a portable Myron L® AGRI-METER with Soil Test Kit. Optimum soil pH is essential for obtaining maximum efficiency from fertilizers and herbicides. This is especially true for artificial growing media which, without buffering capability, are much more pH sensitive than natural soil. In addition, the pH of artificial soils can vary greatly when new, and must be adjusted (leached) before use. 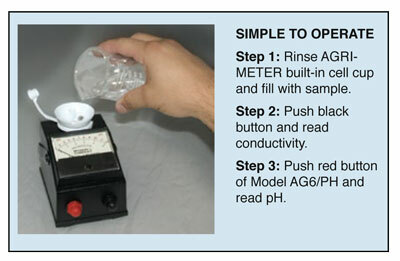 Using a Myron L® Model AG6/PH for checking soil salinity and pH is easy. Simply mix one part soil with two parts pure water in the vials provided with the Soil Test Kit. Some organic media, such as peat moss, need a 5:1 water: soil dilution ratio. Only a heaping tablespoon of soil is required. Agitate container vigorously. Let settle for 45-60 minutes and decant the water into the instrument cell cup. Push buttons to read directly in millimhos/ conductivity (salinity) and soil pH. Regular testing of conductivity insures that fertilizer solutions will contain the optimum level of salinity for maximum plant health and growth. If a fertilizer injection system is used, it can be easily checked with an AGRI-METER by taking a sample solution as it comes out of the end of the hose or "spaghetti" irrigation tubes. Proper adjustment of the fertilizer injector can prevent these common problems: over or under feeding, plant damage and fertilizer waste. Water pH can vary greatly from month to month because of rainfall effect on the aquifer. Irrigation water, if high in soluble salts, can increase soil salinity causing plant damage. AGRI-METER tests water pH and salinity easily and quickly, and readings are given directly in millimhos/conductivity. The correct pH of water used in pesticide solutions is also important in order to insure maximum effectiveness and prevent pesticide "break down". Both AG-5 and AG6/PH AGRI-METERS are calibrated in millimhos, the term most widely used by growers to express electrical conductivity. Some charts may read in other units called micromhos. However, since one millimho equals 1,000 micromhos, conversion is easy. Parts per million (ppm) is also sometimes used. Conductivity/ ppm fertilizer concentration tables can be obtained from your supplier, consultant, or university advisor. pH Buffer Solutions: Available in 4, 7, and 10 pH values; they assure an accuracy of ±0.2 pH units on every test. pH 7 Buffer is especially important, and should be used every two weeks. 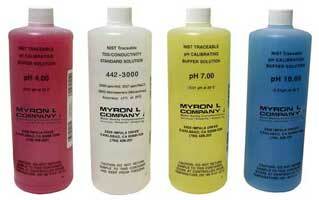 All Myron L® pH buffers are traceable to NIST. certified pH references, and color coded for instant identification. Myron L® AGRI-METERS, excluding pH sensor, have a Two (2) Year Limited Warranty. The pH sensor in Model AG6/PH has a Six (6) Month Limited Warranty. If the instrument fails to function normally, return it to the factory prepaid. If, in the opinion of the factory, failure was due to materials or workmanship, repair or replacement will be made without charge.